A true story of great inspiration and incomparable talent, Businessman First follows one man who becomes successful in the dirty world of business and proved to his family that he can achieve his dream job in flying colors. Henry G. Parks Jr. was a man before his time. Pioneering in the American free-enterprise system, he embarked on a journey leading to a multimillion-dollar industry. He was born in Atlanta, Georgia, to domestic parents and a paternal grandmother, who instilled Christian values and taught him the Bible. A few months after his birth, Parks Sr. relocated his family to Dayton, Ohio, the first state across the Mason-Dixon Line, seeking better job opportunities. During the depression and two more children, times were hard, and Parks Senior’s wife joined him in the workforce. Together, they were able to hold the family together. The presentation of the Phillis Wheatley Book Awards will open the 17th Harlem Book Fair July 16, 2015. It is hosted by Columbia University in New York City, partnering with the Schomburg Center for Research in Black Culture, the New York Public Library, Literacy Partners, Inc, and televised nationally by C-Span Book’s Book Television. It is attended by over 20,000 readers and viewed by millions on C-Span. This annual award, named for the first published African-American female writer is given for ‘literary work and literary advocacy that transcends culture, boundary, and perception’ and akin to the national Book Awards, for best-in-genre titles published the previous year. The Harlem Book Fair is the nations’ largest and most respected African American public literary event. Author’s Bio: Maurice W. Dorsey graduated the only African American in his class at the Bel Air Senior High School, Bel Air Maryland in 1965. He earned a Bachelor of Science degree in Family and Consumer Sciences from the University of Maryland, College Park in 1970; then earned a Master’s degree of Liberal Arts from the Johns Hopkins University in 1975; and earned a second Master’s degree of Education from the Loyola College of Maryland in 1976. He returned to the University of Maryland to earn a Ph.D. in Education in 1985. He has worked in both the public and private sector finding his career in secondary education, higher education, and government. Maurice is a life member of the Alpha Phi Alpha Fraternity and Phi Delta Kappa. He retired from the United States Department of Agriculture National Institute of Food and Agriculture in 2012. Businessman First: Remembering Henry G. Parks, Jr. 1916 to 1989 Capturing the Life of a Businessman who was African American, an authorized biography is his first book. He resides in Washington, DC. The inspiration for my book came from a very successful businessman who was African American. His name is Henry G. Parks, Jr., creator and builder of the Baltimore based Parks Sausage Company. The company’s radio and television ads bellowed: “More Parks Sausages Mom!” “Please!” This ad integrated Mr. Park’s market making him a multi-millionaire in 15 years and one of the wealthiest African Americans of his time and the first African American to issue stock on the New York Stock Exchange. There was a 30 year difference in our ages but we became friends until his death in 1989. I was first influenced to read by my late father James Roswell Dorsey, Sr., who introduced me to The Razor’s Edge by W. Somerset Maugham; my sister, author, Margaret D. Pagan later introduced me to Catcher in the Rye by J. D. Salinger; Another Country by James Baldwin and Black Boy by Richard Wright who became favorites in my early years; however, as an adult I added Running With Scissors and Dry: A Memoir by Augusten Burroughs as another of my favorite writers. I like the freedom of speech and honesty these authors used in telling their stories. 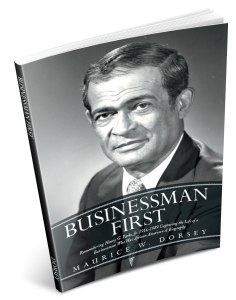 Businessman First Remembering Henry G. Parks, Jr. 1916-1989 Capturing the Life of A Businessman Who Was African American, a biography is my first book. This book was organized for over two decades before life gave me an opportunity to sit down and simply writing it. When I finally got started writing it took 90 days day and night with minimal rest to complete since the decision to write it occurred twenty-five years earlier. I wrote with a moving outline. Thank goodness for cut and paste! I literally moved chapters from back to front and vice versa throughout the process to maintain the flow that I wanted. So much of this was in my head for so long that I could almost sing the book in a song but the lyrics did change and I can say the name of my book Businessman First didn’t evolve until chapter three. At first I could not listen to music as I wrote but as I got more comfortable and fatigued from writing, classical music helped a lot in soothing my fatigue and anxiety about writing my first book. However, if there was a popular song I associated in my mind during the years Mr. Parks was living, it would be “Love Hangover” by Diana Ross. Due to the 30 years difference in our ages the likelihood of us ever being friends was universe orchestrated. It was also at a time in my life that I needed a friend really bad. To date, I have not discovered any keys to success to getting my book out to the public. I learned from Deliah Lawrence, author of Gotta Let It Go, that the best person to market your book is YOU! She is correct, but it is a tremendous amount of work, much more difficult than writing the book. Maybe with more time I will find additional keys other than myself! I highly recommend to new authors to know your audience. Who are you writing the book for and why? There are over 3,000 books published daily worldwide so the competition is out there. So know your target audience otherwise you will be running all over the place spinning your wheels. You also need to know what you want the reader to take away from your book. What is the benefit to the reader? These two things will help you define your audience. How about sharing an excerpt from Businessman First? I am in the process of writing a second book. The working title is Mother’s Boy…Catholic, Gay, Black, and Unwanted. This book will be autobiographical in nature that tells the story of transcending institutional and personal obstacles.